It's Girl Scout Cookie season ladies. I may be watching what I eat (pshh) to try and get bikini ready but Girl Scout Cookies are a WHOLE different story...I was a proud Girl Scout in my little Katie days & they are to.die.for. I simply can't subject myself to not being able to eat any this year. I ordered us 3 boxes already (and hopefully won't have any more than this) from a family friend who's daughter is trying to hit her 100-box goal. Getting the best cookies ever and helping a sweet little girl? I couldn't turn it down, obviously. 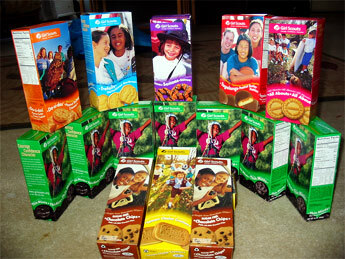 I ordered us these...1 box of Thin Mints, 1 box of Samoa's (or Caramel Delights..what's up with the name change? ), and 1 box of Tagalongs. All of my favorites! I'm hungry just thinking about them. We won't get them until the first week of March but we will be on vacation so luckily I can eat them by the BOX (I have yet to succeed at eating just 2 or 3...) when we get back & not have to worry about getting in a swim suit & possibly looking preggers! Cheers! I was on Yahoo the other day and one of their trending topics was 'Homemade Girl Scout Cookies'. AHH...What, BACK UP, this isn't a joke to ruin my diet, is it?? I'm all over this. You CAN have girl scout cookies year round. Beat butter and sugar until light and fluffy. Add egg and extracts and beat until smooth. Add flour, cocoa, baking powder and salt. Mix until just combined. Place dough in the fridge for about 10 minutes — this will make it easier to shape into logs. Divide the dough into 2 equal portions. Turn one portion onto a piece of waxed paper and roll into a log about 10 inches long and 1 1/2 inches in diameter. (Or bigger, if you want bigger cookies.) Wrap the dough in plastic wrap and refrigerate at least 2 hours, or up 24 hours. Repeat with remaining dough. Preheat oven to 350 degrees. Slice the dough into 1/4- to 1/3-inch rounds. Place on a cookie sheet at least 2 inches apart. Bake until the cookies are firm around the edges but soft on top, about 13 to 15 minutes (or a little longer for frozen dough). Let cool. Melt the chocolate and vegetable oil in double boiler, or in the microwave. Line two baking sheets with parchment or waxed paper. Use a small offset spatula to spread a layer of the chocolate glaze over the top of each cookie. Place the cookies in the fridge for 15 minutes, or until the chocolate is firm. Store at room temp in an airtight container. This version only has 3 ingredients and the word around the street is that these look and taste JUST like them. Start with about 3/4 of a bag (or 6 oz.) of the chocolate chips and melt in the microwave, stirring often, or double boiler or over very low heat. Stir in about 1/4 t of peppermint oil (add by drops until you get a strong, delicious taste you like) Work quickly so your chocolate doesn't set up while you are dipping, or keep it warming in a bowl or pan over another pan of hot water (double boiler style). You can get about 1 sleeve of crackers dipped with about 6-8 oz. chocolate chips. If your chocolate is too thick to dip, you can add 1 tablespoon of vegetable shortening and stir smooth. Don't add butter or water it will seize. Using a fork, dip the Ritz crackers one by one to cover in the melted minty chocolate coating and let the excess drip off before laying on parchment paper or wax paper. Let harden or if you are in a rush, refrigerate to harden. I will be trying the short version this weekend to see how they turn out! Girlfriend, I just ordered 2 boxes myself last week!! Peanut butter patties and Thin Mints!! I cannot wait!! I will be sticking your package in the mail this evening instead of the morning, apparently I only grabbed the pashmina!! I was just digging through my purse, no pearl earrings - hopefully I will get it together soon. don't do this to me! i love girl scout cookies!!! ohhhh no, this may be bad. thin mints are my favorite!! Um I totally need the Tagalongs recipe. Can you email it? And PS - Did you notice that when Tagalongs changed their name (to Peanut Butter Patties or whatever) a few years ago, their taste changed, too? I don't think they're nearly as good as they used to be, and I hardly buy them anymore. Back in the day, though, I would totally eat an entire box in one sitting. I ordered 3 boxes of Samoas. They are MY FAVE!!!! I am sad that prices went up...they are way way more expensive than Chips a hoy at the grocery store not to mention Chips a hoy are just as good and you get A LOT MORE COOKIES! I am seriously the biggest cookie monster ever.....I never turn down a cookie! of Replica Rolex Watches hand-finishing. Why, on a sports watch? It really goes to the part of what a “performance lab” Watches Replica in the high-end replica watch world might need to be. I think the expectation by many consumers handbag replica is that if Breitling tells the tale of how they took their stock movement and handed it to Designer handbags some exclusive Chronoworks lab in their manufacture, the movement will come out UK Replica watches working better and.